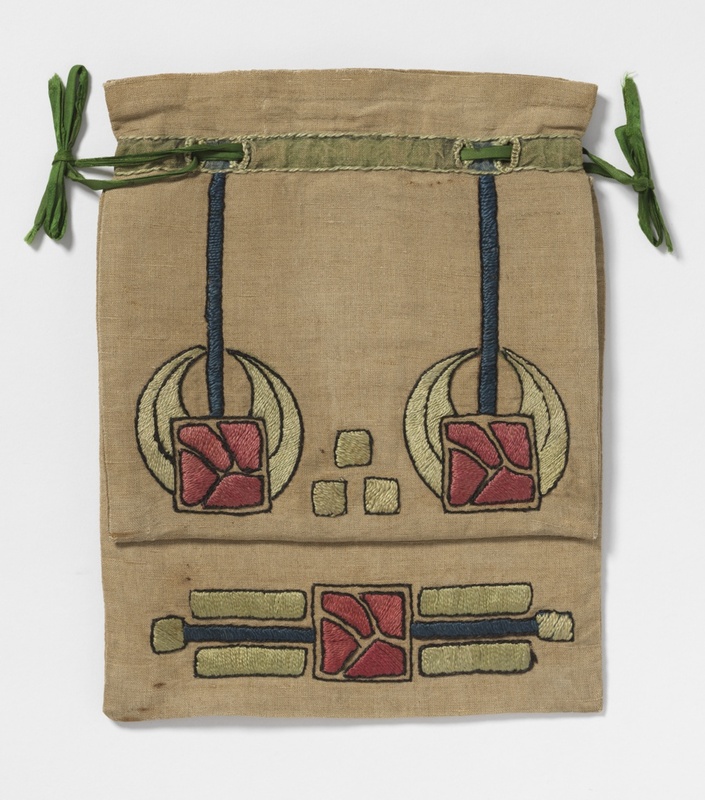 A work bag or sewing bag was a soft cloth bag used by women to store their embroidery implements and supplies, and small, unfinished projects. The bags were a common feature of feminine life from the 17th through 19th centuries, but by the time this bag was embroidered, in the early 20th century, few women were engaged in needlework on a regular basis. This bag shows the influence of the Glasgow School, whose ornamentation frequently included attenuated and abstracted natural elements, balanced by gracefully applied grids. Closely connected to the Arts and Crafts movement, the Glasgow School emphasized the importance of hand-crafted objects as integral to the architectural interior. With the appointment of Jessie Newbery as head of the Department of Embroidery in 1894, the Glasgow Style began to spread, as many of her students were also teachers, and practical courses for teachers were given throughout Scotland and England. The objective of the course was to show that design should arise naturally out of technique. Appliqué and crewel (embroidering with wool threads) became preferred techniques. This simplified design was no doubt worked by a home embroiderer.